Merkel cell carcinoma, also known as neuroendocrine carcinoma of the skin, is a cancer comprised of touch receptor cells in the epidermis called Merkel cells. Merkel cell carcinoma is a relatively rare form of skin cancer with about 1,500 cases per year, compared to melanoma which is 40 times more common.1 However, Merkel cell carcinoma is especially aggressive and lethal, and it can metastasize quickly via the lymphatic system. Biopsy of the sentinel (first) tumor draining lymph node is a prognostic tool that has revolutionized the staging and treatment of a number of common cancers, including breast cancer and malignant melanoma, and it has also been used for Merkel cell carcinoma. This procedure allows for more accurate identification of tumor micrometastases in tumor draining lymph nodes.2 Scientific studies have shown that the amount of tumor burden observed in the sentinel lymph node further refines prognosis in breast cancer and melanoma. As such, rare tumor cells do not carry clinical significance in breast cancer, and thus lead to a separate clinical staging annotation in patients, given the uniquely reduced risk. In melanoma, however, it is known that even rare tumor cells carry prognostic significance. Figure 2. Pattern 1 was associated with lower overall survival rate compared to combined patterns 2–5. All figures originally published in Mod Pathol. 2016;29(2):122-130. Because Merkel cell carcinoma has been relatively rare (although the incidence is increasing), the prognostic significance of variable amounts and patterns of tumor found in the sentinel lymph node was previously unexplored. In a study of 64 cases of sentinel lymph node biopsies involving Merkel cell carcinoma,3 researchers hypothesized that the histological pattern of cancer cells observed in sentinel lymph node biopsies may impact Merkel cell carcinoma prognosis, and that this factor could more precisely stratify expected outcomes for patients with stage III Merkel cell cancers, helping to guide treatment options and expectations with greater specificity. 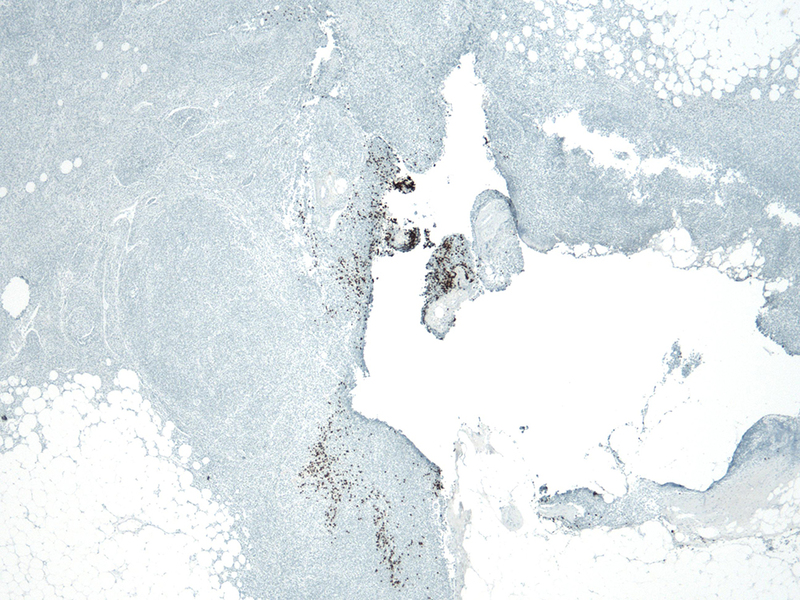 Our researchers observed 5 different histological patterns of lymph node involvement. The most common pattern featured a solid, sheet-like proliferation of metastatic tumor cells with variable amounts of lymph node parenchyma, and this pattern was associated with overall worse survival than any of the other four patterns. Furthermore, there was no significant difference of survival among the other four patterns, allowing all five patterns to be distinguished into two main categories: pattern 1 (solid, sheet-like) or non-pattern 1 (non-solid parafollicular, sinusoidal, perivascular hilar, or scattered parenchymal) (Figure 1). In other words, if a patient’s sentinel lymph node biopsy revealed the pattern 1 sheet-like arrangement of cancer cells, he or she would have a lower expected 2-year survival rate compared to a patient with any other pattern of Merkel cell carcinoma. Figure 3. Significant differences in survival rates between prognostic groups based on sentinel lymph node involvement and other factors. There are significant differences in survival rates between the Favorable, Intermediate, and Unfavorable groups (Figure 3). Patients in the Favorable group (those with patterns 2-5 and only 1 or 2 positive sentinel lymph nodes) experienced very good 2-year survival of 90%, and patients in the Intermediate group (those with one or more poor features including pattern 1 SLN biopsies, advanced age ≥70, or immunosuppression) had a 2-year survival of 73%. In the Unfavorable group (including patients with additional poor features), none of the patients survived within 2 years of diagnosis. In 2016, this staging system was revised, with additional stratifications based on whether the cancer was staged clinically or pathologically, whether a primary tumor was detected, and whether regional nodal disease was detected with in-transit metastases.6 However, even within these substages, the prognostic indications for survival can vary greatly. Using the 3 prognostic groups based on histological patterns could provide physicians with additional information to guide treatment options. For example, physicians may choose more aggressive treatments for Merkel cell carcinomas in the Unfavorable group exhibiting pattern 1 (solid sheet-like) arrangements, since they are associated with worse outcomes than any other pattern. 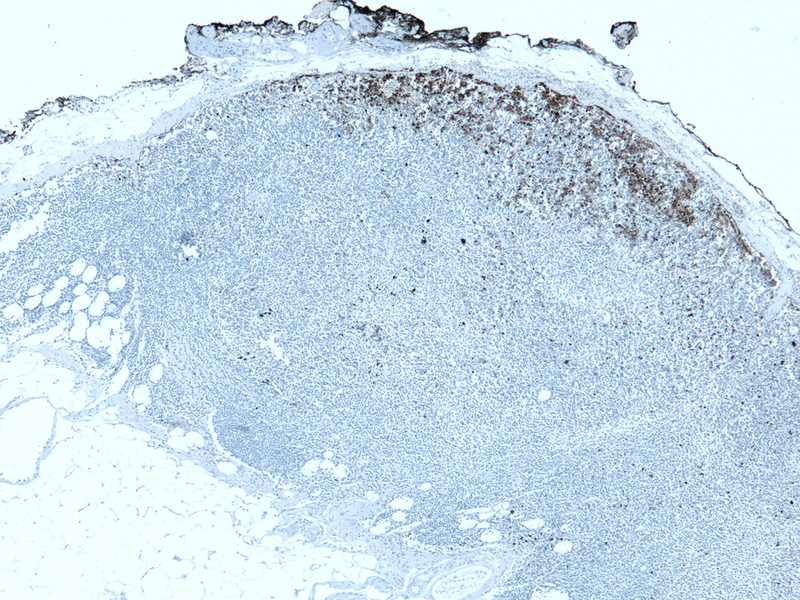 The study of histological patterns of Merkel cell carcinoma also provides additional insight into the imaging techniques used in sentinel lymph node biopsy. Because of their diffuse concentration of metastasis, pattern 1 (solid, sheet-like) carcinomas can be detected even with less sensitive H&E stains, while detection of patterns 2-5 depends more heavily on immunohistochemistry’s ability to reveal more diffuse or isolated tumor cells. 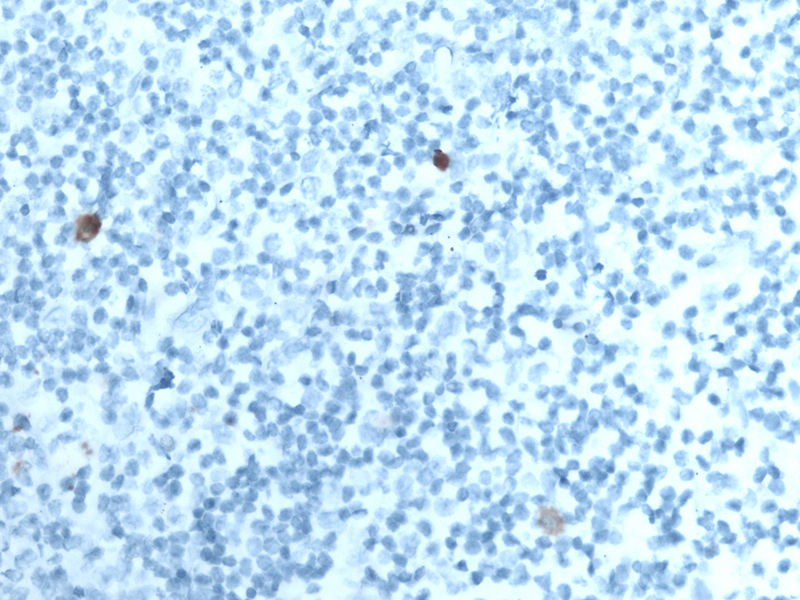 Since the tumors most heavily associated with negative outcomes can be detected from H&E stains alone, pathologists may consider using such methods for detecting Merkel cell carcinoma for diagnosis and prognosis, while more sensitive immunohistochemical methods can be reserved for confirmation. 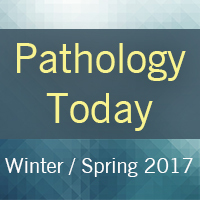 Examination of Merkel cell carcinoma cell patterning leads to several recommendations for prognosis and treatment. As noted, in most cases standard H&E stains are sufficient to develop a meaningful prognosis of expected outcome, since that technique is able to detect the solid, sheet-like histological pattern known to be associated with worse outcomes. Additionally, advanced age and immunosuppression play a distinct role in prognosis of Merkel cell carcinoma, as both factors have been shown to negatively affect outcome. If the sentinel lymph node biopsy does reveal the more dangerous solid, sheet-like pattern, physicians could recommend more aggressive treatment, all the more so for older patients (>70 years old) or patients with compromised immune systems. Treatment options for Merkel cell carcinoma are similar to those for other skin cancers, with surgical excision, radiation, and chemotherapy being typical treatments.7 Surgery can be used to remove both the primary site of the Merkel cell carcinoma and the positive local lymph nodes, and it is recommended to perform the sentinel lymph node biopsy prior to or at the time of the excision surgery.8 Surgery alone may be successful for lower risk MCC tumors, but for higher risk cases of Merkel cell carcinoma, radiation therapy performed in conjunction with surgery has been shown to greatly decrease the risk of recurrence, especially in local cases. There is still some controversy, however, as to how effective adjuvant radiation therapy is to both local recurrence and distant metastasis.9 Additional studies are needed to confirm the exact advantage of adjuvant radiation therapy, but there is indication that this combination therapy could be appropriate for higher-risk patients such as those associated with pattern-1 sentinel lymph node biopsy or the non-Favorable prognostic groups. Chemotherapy for Merkel cell carcinoma has been shown to be effective initially in reducing tumors, but its long-term effects are not durable and MCC can actually develop resistance to the chemotherapy drugs.8 Chemotherapy is usually reserved for palliative treatment of late-stage metastatic Merkel cell cancers, which could include patients identified in the Unfavorable prognostic group based on sentinel lymph node biopsy pattern and other poor features. As an especially aggressive and lethal form of skin cancer, expected outcomes for Merkel cell carcinoma tend to be unfavorable. The information gained from sentinel lymph node biopsies can provide more precise and useful prognostic information for physicians and patients to work with, indicating appropriate methods and treatments based on the proliferation and pattern of the patient’s cancer cells as well as the other contributing factors. In addition to the sentinel lymph node pattern, other significant factors were found to be associated withexpected patient outcomes for Merkel cell carcinoma. Patients with 2 or more MCC-positive sentinel lymph nodes had poorer survival (Figure 2), and older patients (70 years or older) also fared worse. Merkel cell carcinoma is known to be associated with Merkel cell polyomavirus,4 and so patients with compromised or suppressed immune systems—due to either a comorbidity or medication associated with immune suppression—also had poorer survival than immunocompetent patients. By weighting and combining all of these factors associated with survival outcomes, stage III patients (patients with any amount of tumor within their sentinel lymph node) with Merkel cell carcinoma can be characterized into one of three prognostic groups: Favorable, Intermediate, or Unfavorable. 1. Merkel cell carcinoma Multi-center Interest Group. About this disease. Merkel cell carcinoma: information for patients & their physicians. http://www.merkelcell.org/aboutDisease/index.php Accessed October 6, 2016. 2. Shibayama Y, Imafuku S, Takahashi A, Nakayama J. Role of sentinel lymph node biopsy in patients with Merkel cell carcinoma: statistical analysis of 403 reported cases. Int J Clin Oncol. 2015;20(1):188-193. 3. Ko JS, Prieto VG, Elson PJ, et al. Histological pattern of Merkel cell carcinoma sentinel lymph node metastasis improves stratification of Stage III patients. Mod Pathol. 2016;29(2):122-130. 4. Banks PD, Sandhu S, Gyorki DE, Johnston ML, Rischin D. Recent insights and advances in the management of Merkel cell carcinoma. J Oncol Pract. 2016;12(7):637-646. 5. Moshiri AS, Nghiem P. Milestones in the staging, classification, and biology of Merkel cell carcinoma. J Natl Compr Canc Netw. 2014;12(9):1255-1262. 6. Harms KL, Healy MA, Nghiem P, et al. Analysis of Prognostic Factors from 9387 Merkel Cell Carcinoma Cases Forms the Basis for the New 8th Edition AJCC Staging System. Ann Surg Oncol. 2016;23(11):3564-3571. 7. National Cancer Institute. Merkel Cell Carcinoma Treatment (PDQ®)-Health Professional Version. https://www.cancer.gov/types/skin/hp/merkel-cell-treatment-pdq. Updated April 9, 2015. Accessed December 1, 2016. 8. Merkel cell carcinoma Multi-center Interest Group. Treatment. Merkel cell carcinoma: information for patients & their physicians. http://www.merkelcell.org/treatment/ Accessed October 6, 2016. 9. Lewis KG, Weinstock MA, Weaver AL, Otley CC. Adjuvant local irradiation for Merkel cell carcinoma. Arch Dermatol. 2006;142(6):693-700. Jennifer S. Ko, MD, PhD, is a staff dermatopathologist in Anatomic Pathology and Dermatopathology at Cleveland Clinic. She is also the medical director of the Cleveland Clinic Central Biorepository and is a clinical assistant professor of pathology at the Cleveland Clinic Lerner College of Medicine of Case Western Reserve University. Dr. Ko joined Cleveland Clinic in 2003 after completing a 6-year BS/MD program at Northeastern Ohio Universities College of Medicine (now Northeast Ohio Medical University). She completed a 1-year residency internship in internal medicine and then completed a PhD in immunology from Case Western Reserve University. During her PhD training, Dr. Ko worked in the Lerner Research Institute, studying cancer induced immune suppression and immune therapy for cancer. She also worked as a clinical scholar in the Taussig Cancer Institute, caring for patients with melanoma, Merkel cell carcinoma, and other advanced skin cancers. Dr. Ko did her subsequent residency in anatomic and clinical pathology and fellowship training in dermatopathology at Cleveland Clinic. Dr. Ko has authored numerous publications and scientific presentations and is the recipient of several research awards and scholarships. Dr. Ko’s personal research interests include melanoma and pigmented lesion diagnosis, Merkel cell carcinoma, immune suppression in cancer, and identifying novel immunotherapeutic targets in melanoma. She also enjoys working closely with clinical and scientific researchers throughout Cleveland Clinic/Lerner Research Institute on translational research projects that require the support of the Central Biorepository.